Good size for picking up the attic or garage. With only a 6 foot width this container fits in tight spots easily. The two ton weight limit allows for small amounts of disposal. Good size for weekends when you plan to clean out the garage. Get rid of debris in a flash with this size container. Gate in back opens for easy disposal. This container allows for larger items to trash. 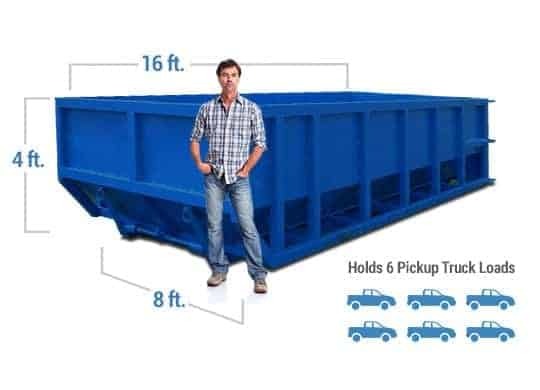 When doing a small remodel to the kitchen or bathroom the 15 foot dumpster is good to go. Planning to redo the main floor in your home? A 20 yard container is a great size for residential jobs. With a 4 foot side wall you are able to lift debris right over the top and throw away. When doing a full home renovation/remodel the 30 yard container will work for you. This convenient size will be your go to when big projects come up. Throw demo and construction debris into this box. Commonly used for large construction sites the 40 yard is a big box. Standing 8 feet tall you may dispose of large amounts of trash in one simple place. 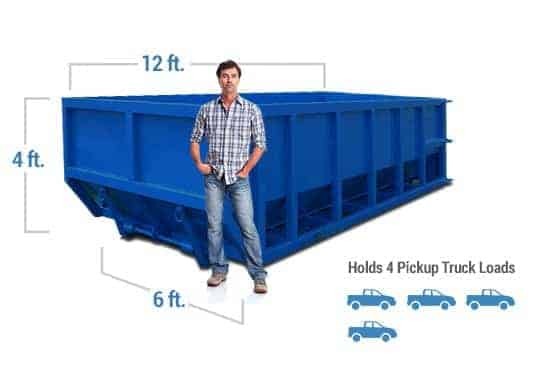 Offerings start at 10 cubic yards and go as big as a 30 cubic yard container. Our team will help you with projects of all sizes big and small. Whether it be a home clean out, renovation, or commercial demolition. Call us at any time Monday through Saturday to schedule a pickup, order a new dumpster or receive answers to all your questions waste related. 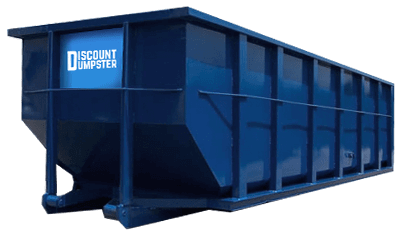 With low, flat dumpster rental rates everything is included in your price. That means delivery, pickup, hauling, and taxes are all in the quote you receive. Simply consult with our educated team to help you find the best size roll off for your project. Open 6 days a week we are here to help. We have seen it all so no question is our of the norm when renting trash services from us. I travel in and out of St Louis so it is difficult to find a dumpster company that communicates well. Discount Dumpster rental was able to answer all of my questions and delivery was on time. You can tell these guys care about their customers. Planning to redo part or most of your home to make it your dream residence? Make this dream a reality through the use of a roll off from us. When starting with a kitchen update a dumpster is the best place to start. Throw everything into one place such as, cabinets, counter tops, and flooring. Get it into the dumpster and our skilled drivers will take care of the rest. Not sure what dumpster size to order? Our team will help guide you to the best size so there are no further questions. Get your house in tip top shape this weekend and it all starts with letting us help you with debris removal. Call now. The best place to start before placing your order is understanding what you plan to throw away. That way our staff is able to point you in the right direction. Throw away household junk, yard waste, and remodel debris all in one simple place. Each dumpster is equipped with a large swinging gate. The best way to start is to walk in your material. Don’t break your back if you don’t need to. With a large array of sizes we also help construction sites with their waste management needs. Whether it be a new home build or large apartment complex we are here to help. Redo a roof with the use of a 20 yard container. We do have certain boxes that handle dirt but those are few and far between. Give us a call ahead if you need to dispose of heavy material. When you need a dumpster rental in St. Louis, and may not have room on your property, you may need to apply for a street permit. To do this contact the City of St Louis Planning Department. From there you will be guided to the Blocking Right of Way Permits section. Permits are required for any activity that will black any portion of the public right of way, including streets and or sidewalks. We have seen it before so give us a call if you have more questions than answers.